Last year, we spent eight months in a caravan. A lot of that time we didn’t have electricity, only solar power, which meant we relied heavily on the sun for our power. This meant we had to be very careful with our power usage. This also led to many screen-free activities; no tv, video games; screens of any kind. This actually turned out to be a real blessing to our family. We started spending more quality time together and really enjoyed it. If you too are crazy about seeing your kids glued to a screen, then this is the list for you! 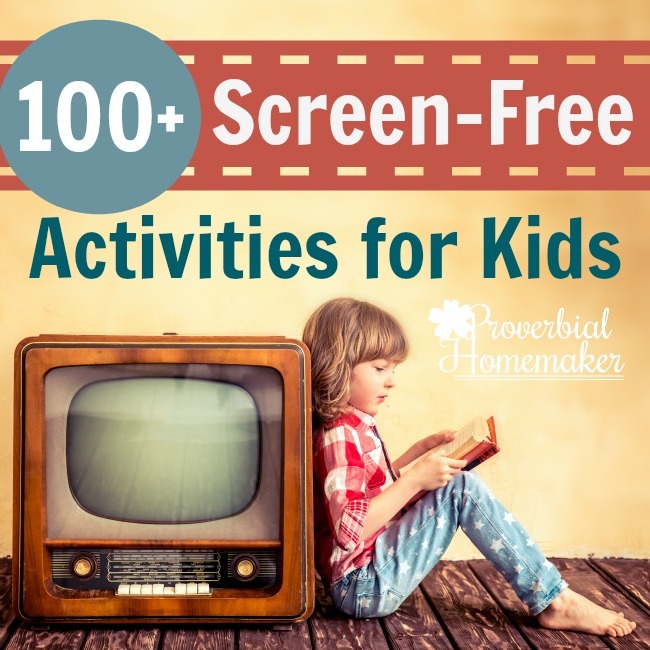 For ease of use, I have categorised the 100+ Screen-Free Activities for Kids into 3 parts: activities you can do at home, activities you can do out and about and activities that you can do weather-permitting. 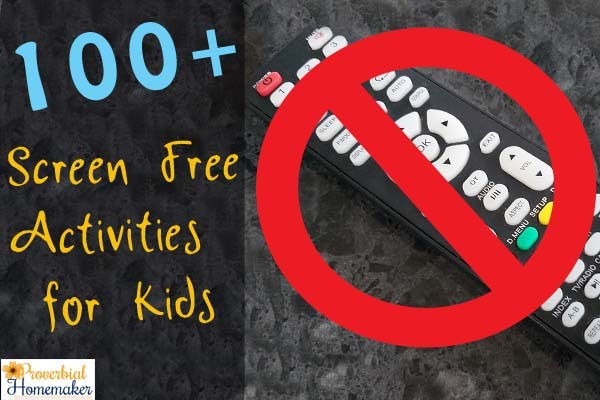 To make it easier for you, I have made these Screen-Free Activities into a printable list for easy reference. Print it out on white cardboard, laminate it and pin it up where the children can easily read it. I think we just found our Bucket List for Summer. Yay!! These are all such good ideas! Kids should take advantage of the suggestions you’ve made above-they certainly wouldn’t have to worry about getting bored. Excellent tips for having fun, whatever the circumstances are! Thanks so much for sharing! your website has been so helpful, Tauna! it is a blessing to have Pinterest as i have discovered your website, very rich information! Although, i am having some problems downloading some of your printables. 🙁 Keep up the good work. Bless you and the work you do! You’re so welcome! I know… I’m perpetually working on making that better 🙂 Always feel free to email me for a direct link! tauna (at) proverbialhomemaker (dot) com. I’m happy to help!